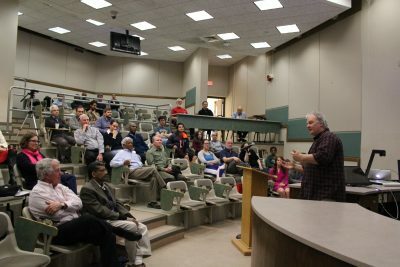 Friday afternoon on April 20, 2018 the UConn Physics Department held a colloquium in honor of Professor Douglas Hamilton on the occasion of his retirement from active service on the faculty. The colloquium was MC’ed by Prof. Jason Hancock, who surveyed the highlights of a career spanning four decades marked by notable accomplishments in research, teaching, and service. Several of Doug’s former students also presented tributes to their mentor, some in person, and some by video or written message, expressing their gratitude for what they learned from him, both by instruction and example. At the end of the hour, Doug presented some final comments, which were followed by a standing ovation in recognition of Doug’s many contributions to our field, our department, and the University. Doug, you will be missed! 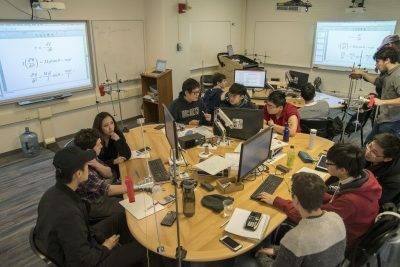 A recently renovated physics classroom in the Edward V. Gant Science Complex was built to pilot a new approach to physics education, integrating lecture with lab rather than the classical approach of separating these components. Students and instructors apply concepts with hands-on activities throughout the lecture, practice new tools, and problem solve as a group. The space is equipped with whiteboards on every wall, and computers and projectors for each station. Though built for entry-level courses such as Physics 1601 and 1602, the end goal is to convert larger classes into this format as well, including entry-level engineering and biology classes, for a more interactive learning experience. 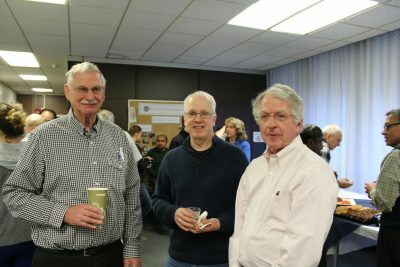 It is with great sorrow that we report the passing of our long-time colleague and friend, George Rawitscher on March 10, 2018, after a brief illness and just having passed his 90th birthday, which was celebrated with a cake at a meeting of the UConn Physics Department. George was born in 1928 in Germany, where his fa-ther was a distinguished Professor of Botany at The University of Freiburg. In 1934 his father, Felix Rawitscher who was Jewish, brought his family which in-cluded George’s mother, Charlotte Oberlander, his sister Erika, and George from Germany to Brazil to escape the Nazis. In Brazil, Felix established and chaired the Botany Department, which still bears his name, at the University of Sao Paulo. George grew up in Sao Paulo, where he learned fluent Portuguese. From an early age he knew he wanted to be a physicist, and taught himself quantum mechanics from a book during high school. He graduated in physics and mathematics from the University of Sao Paulo in 1949, and he served as an Instructor at the Brazilian Center for Physical Research in Rio de Janiero for two years, receiving a Brazilian National Research Council Fellowship. While he was in the Center for Physical Research at Rio, he worked under Richard Feynman who was a visiting professor at the same institute. He told his grandson Nicholas that Feynman had made a big mark on his life, inspiring his approach to physics, and observing that he had the potential to become a “real” physicist, which he remained until the end of his life. Following his time in Rio, George went to Stanford University as a graduate student in theoretical nuclear physics and mathematics. He received his Ph.D. in 1956, for a study of Fierz-Pauli spin 3/2 particles and the anomalous magnetic moment of the muon under Profs. Leonard Schiff and D.R. Yennie. His first paper had to do with the effect of the finite size of the nucleus on muon pair production by gamma rays. While at Stanford, George met and later married Mary Adams, a fellow Stanford student, and they proudly raised two sons, Peter and Henry. Mary, a biochemist, died in 1980. In his later years, George was again happily married to Joyce Rawitscher in 2009, who passed away in 2016. Following his graduate work, George became an Instructor at the Physics Nuclear Structure Center (University of Rochester) for two years and then joined the Physics Department at Yale as Instructor, doing research in collaboration with Prof. Gregory Breit. He remained at Yale as Assistant Prof. of Physics until 1964. 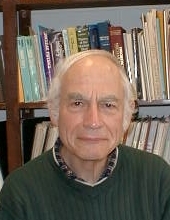 He joined the Physics Department at the University of Connecticut in Storrs as an Associate Professor and then became Professor of Physics from 1972. He retired in 2009 but remained at UConn as an emeritus Research Professor until days before his death, continuing to do active research in nuclear physics, computational physics and ultracold atomic collision physics until his final days. Professor Rawitscher was an engaged and untiring participant both in his Department and in the general community up to the last moments of his life. He promoted public awareness and activism on ameliorating the effects of global climate change and he and his wife Joyce have been active in the peace movement. He was a member of the Storrs, CT Quaker Meeting. He was also active in community service in the Storrs area, for example serving on the Town of Mansfield Sustainability Committee. Recently he has been working on a nearly-finished book summarizing his lifelong expertise in numerical computational physics, under contract with Springer, with two younger colleagues from Brazil. George was a dedicated and effective undergraduate teacher and empathetic mentor to a large number of graduate students, colleagues and collaborators. George was a central member of the department for more than 50 years, and has earned a special place in our hearts forever. His inspiring presence and example will be very much missed at the University, amongst his family, friends and the community, and it was a great loss to see him go. Gizmodo has recently launched a new series of articles to explore how the best images in science were created and why. 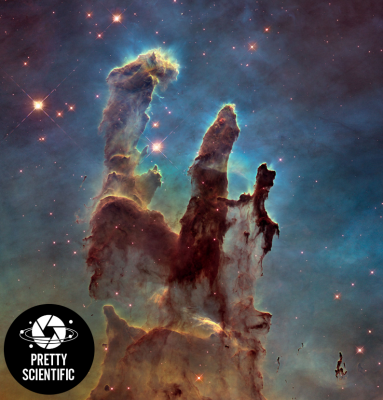 In a recent article in this series by Ryan F. Mandelbaum entitled, “The Making of ‘Pillars of Creation,’ One of the Most Amazing Images of Our Universe”, the author presents a classic set of images taken with the Hubble Space Telescope showing a zoomed-in view of the Eagle Nebula. The article explains some of the details about the instrument that took these images, and how a color image is obtained by combining black-and-white photographs taken at a number of different wavelengths. In the article, UConn astronomer Prof. Kate Whitaker explains why an advanced space-based instrument like the HST is required to obtain awesome views like this of our cosmic neighborhood.